Dalkey Archive Press, 9781564785633, 196pp. To most of us, "subversion" means political subversion, but "The Subversive Scribe" is about collaboration not with an enemy, but with texts and between writers. Though Suzanne Jill Levine is the translator of some of the most inventive Latin American authors of the twentieth century-including Julio Cort?zar, G. Cabrera Infante, Manuel Puig, and Severo Sarduy-each of whom were revolutionaries not only on the page, but in confronting the sexual and cultural taboos of their respective countries, she considers the act of translation itself to be a form of subversion. Rather than regret translation's shortcomings, Levine stresses how translation is itself a creative act, unearthing a version lying dormant beneath an original text, and animating it, like some mad scientist, in order to create a text illuminated and motivated by the original. 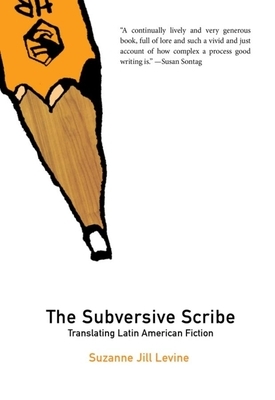 In "The Subversive Scribe," one of our most versatile and creative translators gives us an intimate and entertaining overview of the tricky relationships lying behind the art of literary translation.